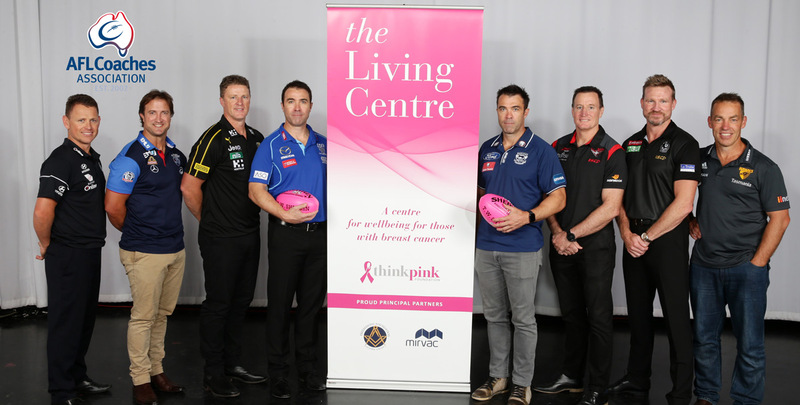 The Think Pink Foundation, a Victorian based charity providing free services to women with Breast Cancer, has teamed up with the AFL Coaches Association to announce a campaign to increase awareness of Breast Cancer and the services of the Think Pink Foundation Living Centre in Melbourne. The AFL Coaches Association has put their support behind the new Think Pink Foundation awareness program ‘You don’t have to run the race against breast cancer alone’ with two Premiership coaches, Alastair Clarkson and Damien Hardwick, featuring in the 2019 CAMPAIGN VIDEO. AFL Senior Coaches and AFLCA Members L/R Brendon Bolton – Carlton, Luke Beveridge – Western Bulldogs, Damien Hardwick – Richmond, Chris Scott – Geelong, Brad Scott – North Melbourne, John Worsfold – Essendon, Nathan Buckley – Collingwood and Alastair Clarkson – Hawthorn. 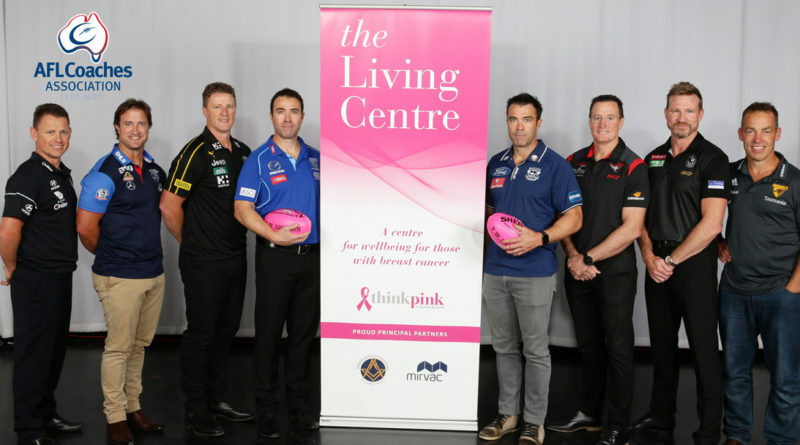 AFL Coaches Association CEO, Mark Brayshaw said, “The AFL Coaches Association is proud to support the Think Pink Foundation which provides free services for women of all ages diagnosed with breast cancer at the Think Pink Living Centre in Melbourne. “It is important for people facing serious health issues that they are able to access professional and caring advice,” Mr Brayshaw said. 2019 CAMPAIGN VIDEO of the Premiership coaches, Alastair Clarkson and Damien Hardwick. Ron Smith, Chairman of the Think Pink Foundation welcomed the involvement of the AFL Coaches Association saying it will provide many opportunities to increase awareness of the Free services of the Think Pink Living Centre. “The AFL Coaches Association will play a role in helping men understand the pressures and impact of breast cancer on women and families. “For several years, the Think Pink Living Centre has run a Supporting Blokes Group offering support, education and coping strategies to male partners and male carers of those with a breast cancer diagnosis,” said Mr Smith. The Think Pink Living Centre was inspired by Irene Hendel OAM, a breast cancer survivor and her husband David, and became a reality with the support of major sponsors Mirvac and Freemasons Victoria with many others, the Think Pink Foundation opened The Living Centre. In September 2010, the Victorian Minister for Health, Hon Daniel Andrews MP officially opened the doors to the Think Pink Living Centre, a state-of-the-art facility dedicated to providing emotional, practical and physical support to women and men diagnosed with breast cancer, their families and carers free of charge.